Building on the success of 2007's The Seattle-Havana Poster Show, curator Daniel R. Smith has gone half way around the world to unite the graphic design communities of Seattle and Tehran. Co-curated with Tehran designer Iman Raad, The Seattle-Tehran Poster Show is a selection of 50 posters from each city in a variety of mediums sharing cultural themes such as music, film, theater and contemporary art. Artists included range from Tehran University Professor Reza Abedini, a powerful figure in contemporary Iranian graphic design, to younger talents born since the 1979 Islamic Revolution, such as the female design duo Soha Shirvani and Reyhaneh Sheikhbahaei. 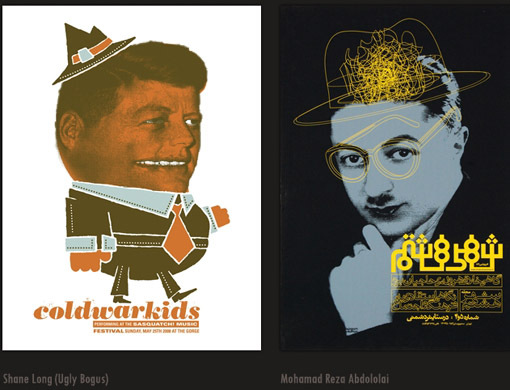 These Iranian designers' posters are paired with the work of Seattle designers, such as Cornish College Professor Robynne Raye of Modern Dog, Coby Schultz and Barry Ament of the Ames Bros and many more. 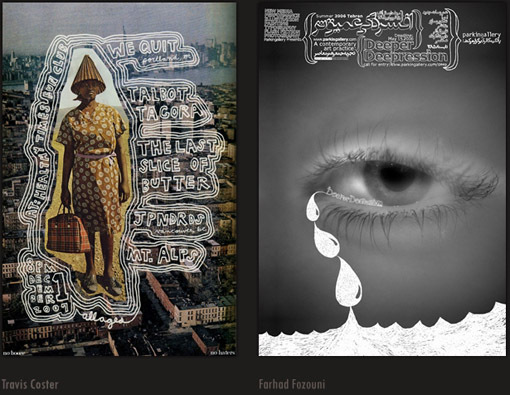 When The Seattle-Tehran Poster Show premiers at Bumbershoot in August 2008, it will be the first exhibition of contemporary Iranian posters in the United States. In 2009 this exhibit will travel to Tehran where it will be shared with Iranian designers generally prohibited from visiting the U.S. While preparing to leave Seattle for Tehran last December, there were times when I wondered 'What have I gotten myself into?' Tensions between our two countries were running high and friends and family were concerned for my safety. Small wonder-the images we hold of Iran were formulated in 1979 with the Islamic Revolution and reinforced ever since by politicians and media who present us with the most incomplete portrait of a country one could muster. Imagine my surprise when I arrived in Iran and found an entire nation of people friendlier towards America & Americans than many of our allies. Strangers in the street, curious as to where I was from, often could not contain their excitement at meeting an American. The effect was surreal-at home our president considers 'all options on the table', including nuclear strikes when talking about Iran-while in Tehran strangers asked, please, can they have their photo taken with me. In preparation for this trip, I researched Iranian designers and a series of websites led me to a network of talented people in Tehran. I invited several of them to meet with me in my hotel and discuss this exhibit. The greatest response came from a loose association of young designers, most being recent graduates of Tehran University. These designers were born in 1979, or later, and grew up knowing only a post-revolutionary Iran. Their design work is quite different from anything being produced in the States, at least on the surface. The exoticness of Persian typography is strange, seductive and utterly fascinating to an outsider. These designers say their generation has struggled to create a new graphic identity for themselves. Graphic design is an idea imported from the west. Its jargon has no clear equivalent in Farsi, so English words such as 'posters' and 'typography' have become the standard in their industry. Persian typography itself, once viewed as an inhibitor to Iranian design by Iranians themselves (something to hold up against the design of the west) has become their cutting-edge area for exploration. With much credit going to the guidance of famed Tehran University professor Reza Abedini, they have found something 'ownable.' The flexibility of this new Persian typography is incredible-Farsi script becomes so much more than 'type' in their hands, it becomes image itself. In their designs the word is image, the image is fluid, and Roman characters become clunky, rigid, hopelessly static by comparison. The influence of Iranian theocracy and local interpretation of the Muslim faith, with its concerns of idoltry in printed representations of humans and animals, is an underlying strain to their visuals. While these images are not banned in Iran, as in certain neighboring countries, the number of purely typographic posters produced by this post-revolutionary generation of designers speaks to concern in this area. Through contacts made and friendships born on my first visit, I expect that 'The Seattle-Tehran Poster Show' will travel to Tehran in 2009. This is a valuable step in showing members of each other's wider communities how we truly think and feel. It humanizes our view of the other side and demonstrates not simply a willingness to reach out to one another, but a concrete example of how to do so. Through last year's exhibit 'The Seattle-Havana Poster Show' I saw the broad acceptance of this premise-an estimated 9,000 people saw the show in Seattle without a single question as to why we gave voice to a nation perceived as at odds with our own. While being a potentially higher-profile and more politically-charged exhibit, I expect a similar reception by the public of this show, with proportionally higher rewards in breaking down barriers and challenging stereotypes.